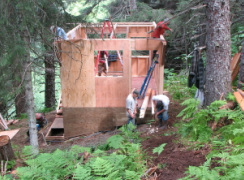 Dillon & Dillon Timber & Log Wrights is a family owned construction business operating out of Seldovia, Alaska. 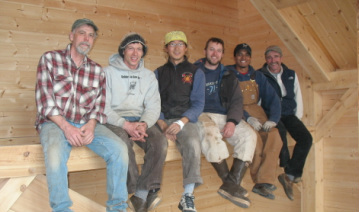 We specialize in the construction of custom Timber Frame, Scribed Log, and Conventional stick frame homes. In addition to custom homes, we also have completed many industrial and commercial construction projects. Owners, Tim & Ila Dillon work directly with clients to develop custom designs for homes from site layout and building design to interior designs. Along with Tim Dillon, a licensed General Contractor, we have a crew of professional carpenters on staff. 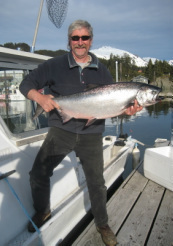 We've been building custom timber & log homes since the early 80's mainly around Kachemak Bay. 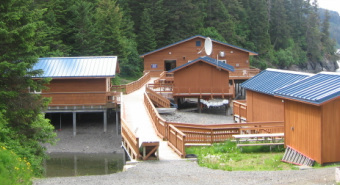 We've also built various homes on the Kenai Peninsula, mainly in Homer, as well as Girdwood, Eagle River, and a special project in La Fox, Illinois. Aside from the project in Illinois, all timbers (posts, beams, and rafters), logs, and most siding are milled in Seldovia from local Sitka Spruce. Timber Frame and Scribed Log packages can be shipped anywhere in the state to locations on or off the road system. Once on site, a Timber Frame or Scribed Log shell can be stood up in less than a week. Contact us today to learn about how we can help you build your dream home. 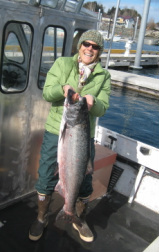 If we don't respond right away, we're probably out fishing for Kings! Site under construction, please continue to check back for updates. Select images below for more information about our types of construction.